This is the eleventh post in a multi-post series about my time on a Japanese television show. If you haven't read that which came before, I suggested you go back to the beginning. If you're caught up, forget I said anything and carry on. We got back into the van and drove out of Tomei, taking the road we had driven earlier that day and heading back to Fukue. I always sat in the same place in the van, the seat directly behind the driver, where I could look out the window at the passing scenery. Saori-San sat next to me and while I admired the view, we talked. She was impressed by how I was in front of the camera. "I've done a couple of these shows now," she said, "and as far as I can tell, the Americans are always the most comfortable in front of the camera." She seemed to be including me in this group and I was surprised to hear that she thought I seemed comfortable. I had assumed that I looked like I had a severe toothache, considering how edgy the whole experience was making me. But, who was I to argue? At her bidding, I tried to think why it might be that Americans were more relaxed during filming. "Well, in America, we have a heavy culture of reality tv shows. Maybe it's just that people in America think there's a strong possibility that they might end up on tv at some point." Of course, I never had expected such a thing. I asked her where she had grown up and she told me that her hometown was at the foot of Mount Fuji. Her parents still lived there and she was planning on visiting them after filming was done. She described the town a little bit and I was enchanted. Then she told me that she had lived in Wales for three years, which is where she perfected her English. "Oh, I thought you must have learned somewhere in the UK," I said. When she looked surprised I clarified. "I could tell by your accent." This seemed to be news to her, apparently, she hadn't noticed her accent at all, which was very posh. I guess it's probably less easy to pick out regional accents when it isn't your first language. Once we were in town I noticed that we were taking a very familiar path. In fact, we ended up at the very same restaurant where we had eaten lunch. You-San gave me a satisfied look. "You can see how good of a restaurant this is if the locals pick it out of all the others to give you a welcome dinner." He said this in a way that told me he takes great pride in his ability to find the best meal in town. I was perfectly happy to be back but I would probably have been happy to eat literally anywhere in all of Japan, so I'm not sure we should go by my feelings. We entered the building and I heard the familiar gurgling sound of the fish tanks. Things looked much as they had when we had left hours before, only there were more people, sitting at the booths, enjoying their meals, and staring at the American girl followed by an entourage of camera-wielding professionals. I tried not to look excessively self-conscious and followed the owner of the restaurant towards the back of the room. This time, instead of sitting at a booth, we took a staircase to the second floor. It was quieter upstairs, with a dim hallway that connected several private dining rooms. Ours was the first room, where we found a long, low table lavishly adorned with plates and platters of fresh seafood. I was so overwhelmed by this bounty that I didn't take a single picture of it. You will just have to take my word for it, it was not unlike the scene in Spirited Away where No Face is having a private banquet. The brothers and Mrs. Hamaguchi had already arrived. The children were also there, eagerly anticipating the meal with the kind of energy only hungry little kids can. I took my seat on a thin cushion on the floor, sitting next to Mrs. Hamaguchi and across from the brothers. The children settled on the other side of Mrs. Hamaguchi, all squirming where they sat. As for the film crew, they gathered on the other side of the room, facing me. Dinner with a side of pressure. This is actually from dinner on the second night but I wanted you to have a visual. The dishes in front of me where mostly sashimi, various types of raw fish, sliced paper thin and arranged decoratively on communal platters. There were also bowls of soup, small dishes of pickled vegetables, and several other types of fresh and cooked veggies. But these were mere sideshows. The sashimi was the show stopper. There were more types of fish represented than all the kinds I have eaten in my life put together. 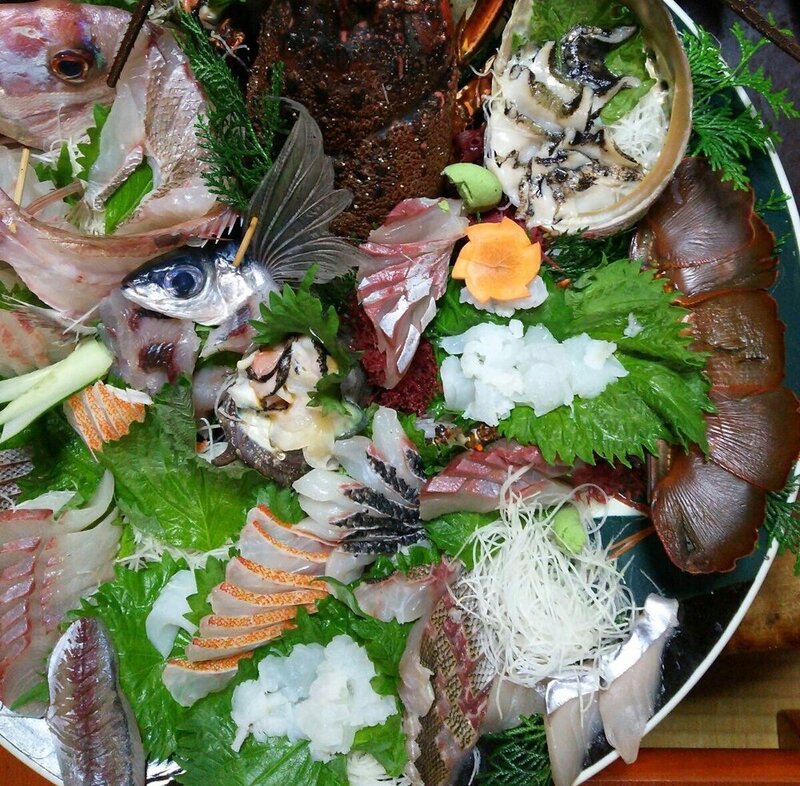 They were cut with loving precision and skill, garnished with seaweed, shiso leaves, and other fresh green herbs. The fishes' iridescent skin shimmered in the ambient lighting. It was a food blogger's dream. The Hamaguchi family was delighted with my wonder. Jiro-San pointed out one particular dish, which I recognized immediately. "Uni!" he said a huge grin on his face. I knew what he was getting at. When I had first been invited to Japan, Ayako-San had asked me if there was any food that I couldn't eat or didn't like, so she could pass the information on to my hosts. I told her I was fine with everything, though, I really don't like sea urchin. This is perfectly true, I think it is the grossest thing on the planet, with the texture of cold butter blended with raw egg whites, and a flavor reminiscent of the fishiest fish you have ever eaten mixed with petroleum. Not to mention it looks like a slimy orange turd. So, yeah, not a fan. Needless to say, I was non-to-pleased to see this scourge of the ocean sitting on a plate next to me. "We heard you don't like uni," said Saburo-San. Not wanting to be rude, I made a non-committal noise and said that I hadn't liked it when I had eaten it in the past. "But you've never had fresh Japanese uni?" I confirmed that this was true. The first time I had it I ate the uni in a restaurant in Bangor Maine. So, it was either an Atlantic sea urchin or something that had been frozen and transported god knows how far. Having moved from Alaska to Maine in my youth, I'm perfectly familiar with what the taste difference between Pacific and Atlantic can be. Thus, I was more willing to try the uni than I would have been at home. It was clear that they all really wanted me to try the uni, especially You-San, who I could easily see, from the look of glee on his face, was the orchestrator of this culinary dare. Figuring I should get it over with, I took up my chopsticks and scooped a little of the slimy muck up to my mouth. Yeah, I still don't like uni. However, it was considerably better than the sample I had eaten in the past, but I still can't vouch for the texture. My truthful statement seemed to satisfy them and I was directed to try some of the other fish, such as the flying fish or tobiuo that some of the kamaboko had been made out of. As I said, the sashimi was all on communal platters. Knowing a fair amount about Japanese etiquette, I turned my chopsticks backward and picked up a piece of fish, moved it to my own plate, then flipped them the right way to put the food in my mouth. "How did you know to do that?" asked Jiro-San. I said that I had read about it somewhere and they were amazed that an American could find out something like that. Luckily for me, the internet is full of stuff like that for anybody who wants to know. Mrs. Hamaguchi then told me that in mixed company it was polite to use this method for communal dishes but inside of your family it was okay to ignore this. Then Jiro-San told me that I was free to consider myself a member of the family. I was very touched by this gesture and fully took advantage of my chopstick freedom for the rest of the meal. From the start of dinner, I had noticed a number of plates that held a single dish. It was a whole fish, presented belly up, with it's interior acting as a bowl for a soupy, gravy-like substance. When they noticed me looking at it they told me that this was a specialty of the Goto Islands. The fugu fish is gutted and baked, with a mixture inside that is made of miso and the fish's liver. When you eat it you use a special wooden spoon to scrape the meat from the inside of the fish and mix it in with the miso and liver. It sounded very intriguing, so I tried it out, struggling to get the spoon to scrape anything. Jiro-San took over for me and expertly mixed the meat into the gravy. The flavor was packed with an amazing amount of umami. I've never eaten anything like it. I told them how much I liked it and in an offhand way Saburo-San said, "yes, fugu is the poisonous pufferfish." I nearly choked on my fugu liver gravy. If you've never heard about the poisonous pufferfish and its role in Japanese food, you clearly don't write a blog about Japanese food. People bring it up to me all the time. I'm pretty sure at least one person asked me if I would be eating some on my trip. They always want to know what I think about "the world's deadliest dish", sashimi made from pufferfish. My answer is always the same, I don't really know anything about it, it doesn't interest me. This might surprise you since I claim to be interested in everything to do with Japan. But, ever since I was a little kid and I accidentally ate false lily of the valley (a poisonous plant), I have been very keen to avoid any poisonous foods. I never had any plans to eat pufferfish. But, fate seemed to think it would be funnier if I did it without realizing it. "So," I said, trying to sound unconcerned, "this was once poisonous?" Jiro-San nodded and explained to me that when they make the dish they prepare it in such a way that there is no poison left. With fugu sashimi (fugu sashi), the chef, who must be specially certified, doesn't get rid of the poison totally. They leave a small amount, which won't kill anybody, but causes mild euphoria. With the Goto specialty, they leave no poison at all. Now, since I've been back in the states I have read more about the fugu and I have only gotten more confused. They told me that the liver is what they made the miso sauce out of, but that is the most poisonous part of the pufferfish. Since I wasn't poisoned I can only assume that I misunderstood them. Not surprising, considering the vast language barrier. But, as I have no plans of attempting to make this dish myself, I guess it doesn't really matter. We talked a good bit while we ate but as the evening drew forward it became clear that my exhaustion was once again tapping me on the shoulder. Since I had to be up at the crack of dawn to go fishing the next morning, You-San arranged for Yuki-San and Mine-San to drive me to the hotel while the rest of the crew ate their own dinner. This sounded good to me since I was nearly falling asleep where I sat. I said goodnight to the Hamaguchi, thanked them for the dinner, and took my leave. In the next post, I will tell you about my morning net fishing with Kaisaki-San and his son. Exciting stuff! Until next time, always make sure you know what you're eating. If you'd like to read about some NOT poisonous Japanese fish, you can check out this post, where I give my recipe for salmon teriyaki.